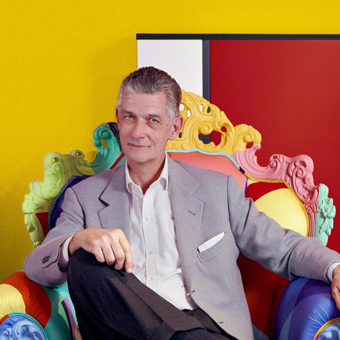 Giulio Cappellini is a real iconic figure of the Milan Design Week: his products and events have characterised both the Salone and the Fuorisalone. Cappellini’s inaugurations at the Fabbrica del Vapore and the Palazzo delle ex Poste have in all respects become part of the Milanese design mythology. Nobody can tell us about the liveliest week of Milan better than him. Fuorisalone is the most exciting moment for Milan. A real international happening. The Fuorisalone is the most exciting moment for the city of Milan. All its districts are now involved in this event that brings every year a huge number of visitors from all over the world, a real international happening. There should be no competitiveness between the Salone and the Fuorisalone. Every company chooses according to its own strategies. Let’s not forget that the success of Milan as capital of design lies in the balance between and strength of both the events. I met many people during the design week. I can’t avoid mentioning my relationship with Nendo, born over ten years ago at the Salone Satellite or my friendship with Marcel Wanders of whom I promoted many exhibitions during the Fuorisalone. Years ago, in an almost unknown Tortona district, Cappellini had more than 10,000 visitors at the opening of his event, something like a football crowd. At the Salone you must be very professional, not only showing good products but telling the story of the company in a complete and consistent way. I wish the Fuorisalone privileged the quality of its events without becoming a country festival. I wish the Fuorisalone had a planned itinerary to allow everyone to move around easily. That would be the only way to keep Milan’s supremacy in the world.